For information on the newly released book "The Invitation" click here! "A Journey; Science Essays on the Leading Edge of Discovery"
"A Journey; Science Essays from the Leading Edge of Discovery" has 600 of the most beautiful pictures of space ever assembled in one book! From supermassive black holes to the moons of our solar system, to extrasolar planets, dark energy, and dark matter, place yourself on the leading edge of discovery in Astronomy and Cosmology as you travel along with this guide to the most profound astronomical discoveries of our time! Linda Morabito Meyer is the Astronomer who discovered the active volcanism on Jupiter's moon Io on March 9, 1979 at NASA's Jet Propulsion Laboratory, while working as a senior engineer on NASA's Voyager mission to Jupiter. Her Astronomy degree is from the University of Southern California. She is an associate professor of astronomy and mathematics at Victor Valley College in Victorville, California where she lives with her husband Astronomer David Meyer and their family. Lynda J. Viken has a B.S. in Accounting and a Master's in Business Administration. Her love of computers and expertise in software applications has led her to work with Linda Morabito Meyer in designing and maintaining lindamorabito.com and ultimately in collaborating with Linda on "A Journey." Lynda and her husband Pastor Brad Viken live in Hesperia, California. David Meyer has a Bachelor of Science degree in Geology from the University of Nebraska, where he received a Commission as a 2nd Lieutenant in the USAF upon graduation. After his 21 year career as a USAF pilot, he now runs the Luz Observatory in Apple Valley, as well as the planetarium at Victor Valley College, where is an associate professor of astronomy. He lives with his wife Linda Morabito Meyer in Victorville, California. Purchase "A Journey" on Amazon.com! "PARALLEL UNIVERSES, A MEMOIR FROM THE EDGES OF SPACE AND TIME"
PURCHASE THE BOOK ON AMAZON.COM! OR ORDER FROM YOUR LOCAL BOOKSTORE! Parallel Universes Sale Price at Barnes & Noble on-line!!! I am grateful to God for the way my journey in life unfolded. Had I known what the reality of my life was at an early age, I could never have achieved the accomplishments in my field of Astronomy, which I love. Had the mystery of my life as presented on these pages been solved quickly, I would have never been motivated to write this book. The reality of each, the cold truth and the solution to the great mystery in my life, are too disturbing to base a literary work on, in my opinion, particularly because this is a memoir and all real. As a scientist brimming with love of this universe, I could never have moved forward with my education in science at an early age, and the messages of this book, which are in fact quite positive, if I had known what I do now. In fact, right up until the moment the abuse that I suffered got the name and the face of a killer, I wrote about the joy of the pursuit of scientific knowledge in the universe and understanding our place within it; the mighty help that is available for people who have suffered trauma; and the Promise that God has for our lives, which I witnessed many times as a child. Not to mention the importance of cherishing children everywhere. I realize that eventually you will read in these very pages that for a while, a little girl who would go on to become a world renowned scientist spent some time on this Earth as the target of a psychopath, and for that there is no helping her. Otherwise, she has soared in a universe more glorious than anything we as human beings can imagine. Parallel Universes, a Memoir from the Edges of Space and Time! "...This book took me in immediately! I couldn't bear to put it down... I was swept up in the moment of each discovery, both the scientific, and the personal, by the unstilted conversational style of the author. This piece is an easy read, filled with pathos and triumph. In a word...BRAVO!" Jane Harris, December 9, 2010, posted on Amazon.com. "...I have a lifelong passion for science, and a lifelong commitment to Jesus Christ as well. I believe a scientist can also be a Christian; that he needn't park his brains to have faith in God. I further believe that a scientist should be truly open-minded, and not discount the spiritual part of man and the universe. By turning a blind eye to the spiritual aspect of nature, a scientist is truly blind to a vast realm of scientific knowledge." 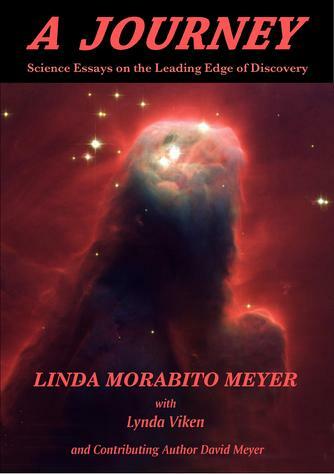 "The science is wonderful...the growth and discovery of personal strengths...combined with faith...equally fascinating..."
"Linda's book will have a wide appeal in the religious and scientific communities. It will be a great attraction to astronomers and church members. This promised book would bring an important link between science and religion..."